Habit: Shrub, tree, evergreen or not; monoecious. Leaf: simple, alternate, petioled; margin entire to lobed; stipules small, generally deciduous. Staminate Inflorescence: catkin or stiff spike, many-flowered. Pistillate Inflorescence: 1--few-flowered, generally above staminate inflorescence; involucre bracts many, generally overlapping, flat or cylindric. Staminate Flower: calyx generally 4--6-lobed, minute; petals 0; stamens 4--12+. Pistillate Flower: calyx generally 6-lobed, minute; petals 0; ovary inferior, style branches generally 3. Fruit: 1 nut subtended, partly enclosed by scaly, cup-like involucre or 1--3 nuts subtended, enclosed by spiny, bur-like involucre; mature years 1--2. Seed: generally 1. Genera In Family: 7 genera, +- 900 species: generally northern hemisphere. Note: Wood of Quercus critical for pre-20th century ship-building, charcoal for metallurgy; some now supply wood (Fagus, Quercus), cork (Quercus suber), food (Castanea, chestnut). Lithocarpus densiflorus moved to Notholithocarpus. Habit: Evergreen. Leaf: leathery, adaxially +- glabrous, green, abaxially golden, with densely spaced, minute, appressed scales, margin entire or +- wavy above middle; stipules generally deciduous. Staminate Inflorescence: branched or not, stiff, clustered or not, ascending to erect. Pistillate Inflorescence: clustered below staminate on same or separate stalk, 1--3-flowered. Staminate Flower: sepals generally 6, minute; stamens generally 8--10+. Fruit: nuts 1--3, enclosed by spiny, bur-like involucre, ovoid to +- spheric, +- angled; mature year 2. Habit: Shrub < 3(10) m; top rounded. Stem: trunk bark generally +- thin, +- smooth, generally not furrowed. Leaf: petiole 4--15 mm; blade 2--8(12) cm, +- elliptic, adaxially dull green, abaxially golden to rusty, base tapered to rounded, tip obtuse to rounded. Fruit: bur 2--3.5 cm diam; nut 8--13 mm. 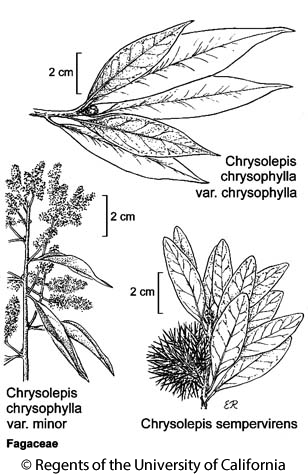 Citation for this treatment: John M. Tucker 2012, Chrysolepis sempervirens, in Jepson Flora Project (eds.) Jepson eFlora, http://ucjeps.berkeley.edu/eflora/eflora_display.php?tid=19401, accessed on April 26, 2019. KR, NCoRH, CaRH, SNH, SnGb, SnBr, PR, w MP; Markers link to CCH specimen records. Yellow markers indicate records that may provide evidence for eFlora range revision or may have georeferencing or identification issues. Purple markers indicate specimens collected from a garden, greenhouse, or other non-wild location.